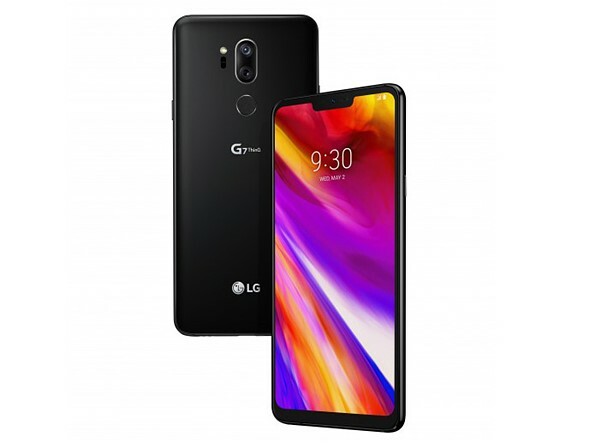 After a few months' delay (the reasons of which are not entirely clear) LG is the last of the big mobile manufacturers to finally unveil its new 2018 top-end smartphone. The new model is called the G7 ThinQ, and comes with most of the photography features and characteristics you would expect from a current flagship device. An almost bezel-less 6.1-inch LCD display with a resolution of 1440 x 3120 pixels is combined with Qualcomm's latest top-end Snapdragon 845 chipset, and embedded into an IP68 dust- and water-resistant body. There is also a 3.5mm headphone jack with a quad DAC and a microSD slot for memory expansion. The device is available with 6GB RAM and 128GB of storage or 4GB RAM and 64GB storage. In the camera department, LG is sticking to its strategy of differentiating itself from most competitors by offering a super-wide-angle lens in the dual-camera setup. Both sensors now offer a higher 16MP pixel count, compared to the G6's 13MP, with the main camera boasting a 71-degree field of view, fast F1.6 lens, optical image stabilization, and an autofocus system that uses both phase detection and laser. The super-wide-angle has to make do with a slower F1.9 aperture and without OIS. It also only comes with a fixed focus. Like on the V30S, camera operation is enhanced by LG's artificial intelligence technology that can detect objects and scenes and auto-adjust camera settings accordingly. Additionally, there is a "smart pixel-binning" mode for lower noise and better exposure in low-light shots. Finally, we also get a "fake-bokeh" portrait mode on an LG flagship, which can artificially blur the background in portrait shots taken with both main camera and super-wide-angle. LG is late to the game for 2018, and we'll have to see if consumers are interested in the brand's super-wide-angle camera concept when most other manufacturers bet on telephoto lenses in their dual-cam setups. In any case, it's good to have one more option in the high-end bracket of the Android smartphone market. I saw someone take a photo with the LG G5. It was super sharp. dX0Mark score please ? Maybe not. Dx0Mark is in bankruptcy restructuring, too bad. Sorry, LG. Life is not Good after all ... iPhone X, P20 Pro and others has had the mark of Dx0Mark. What I don't understand about LG is that they always seem to have 2 phones competing with each other. The V30 and G7 are very similar, the V20 and G6 were also very similar. Simply because of LG is desperate in safeguarding royal users. Looks great. Kudos for leaving the 3.5mm Jack and microSD. Could easily be my next phone. I am slightly confused with the front camera FOV. Some sites say 80 degrees (which is quite common for all phones) and some say it is 90 degrees which is slightly wider. So what is it really for the g7? LG always made very good phones, but they always missed something. I hope this time will make the complete product. For start... this phone looks very good. Maybe best looking phone currently. LG Mobile hasn't been doing that well recently, so is this phone the answer to that problem? Maybe the notch is the answer? I don't think so. looks nice n wide, even if a 1:1 square sensor! I love my G5's wide angle lens, I'll be looking at this seriously to upgrade. I'm a UWA bigot on ILC's so I fail to see why i wouldn't want one on my phone. It continues to amaze me how you manage to get it wrong 99% of the time. You just love to post misinformation without providing any evidence. Do yourself a favour, if you have facts stick to them, give your 'analysis' a miss, it insults our intelligence. Please link to the Samsung phone with a notch, because as far as I can see, it doesn't exist. it's out there. don't be lazy. I NEVER said Samsung had a MODEL with the notched display, only you did. I suspected you might say something like that, but in that case, why does it matter? Also how did Samsung users reject something they could never buy or use? The fact is that the "Notch" is a relatively new things to normal consumers. There is also no doubt that it was popularised by the iPhone, so essentially Apple "leads the way", as usual, even though Apple is rarely first at anything. I am amazed that the notch is such a massive subject for discussion. Who cares ...notch /no notch/changeable notch.................................some folks have to have something to harp on about. I haven't lost a single nights sleep worrying about my notch . no matter how many ways one designs the notch, it looks very unappealing = ugly ! Missing OIS and fixed focus reduces the purpose for video, which is a real bummer. My wishlist is wide-normal-tele in a three lens setup, which also makes most sense artistically! Took some digging, but apparently the UWA FoV is 107 degrees, or about 16mm FF EQ. Now why couldn't DPR provide that titbit? Also, price? Or is it FREE? Just wonder why LG did not use EIS for the Super-Wide camera? EIS on UWA can produce very ugly warping artifacts. Maybe that's the reason? If it wasn't fixed focus, I'd be real interested in this. I love wide angle! But fixed focus is crippling. I know the depth of field will be large, but even so the lack of focusing makes this a complete non-starter for me, at least until I've seen some samples of what the results look like for both very close and very distant objects. I have the G5 with the same principle and have not found it an issue for landscape or architecture. Have a look at the older reviews to give you an idea. I think the G5 version is equivalent to a 10mm or 11mm lens on FF (different aspect ratios, obviously). I have owned a g5 for 18 months and literally only just found out the UWA is fixed focus. Love the uwa camera and fixed focus has never been an issue. anticipation_of - just a heads up, I don#t want to mislead: the G7's lens is less wide than on the G5 (11mm -> 16mm eq), but as I said further below, the G5's lens has some serious distortion towards the edges, so you might not be missing much. That's OK, I'm waiting for the review in either case before I decide if this is my next phone. Overall IQ is important, the wide-angle lens would be nice but it needs to be backed up by overall performance on par with its peers. Hyperfocal distance should be around 60cm so anything farther than 30cm from the camera will be in focus. Is that 13mm? Incredible. I suddenly liked this phone. New G7 has 107° which is 16mm@FF as noisephotographer said, whereas the old G5 had 135° which is about 10mm@FF, but it had some rather fisheye-level distortion towards the sides. How wide? The specs say 107 degree coverage so would that be about 16mm? There are two cameras, one with the 71° (~25mm) f/1.6 and one 107° (~13mm) f/1.9. I like the wider angle, but am not so hip to the fixed focus. Yes, should be approximately 16mm, if it is a rectilinear lens. The main camera is equivalent to 30mm. OK, so the proper measurement is the Diagonal? I assumed it was the horizontal. Learn something new all the time. Yes, usually it is related to the diagonal.